Welcome to my bite size. One of 12 blogs in a new series looking at leadership characteristics. I think curiosity is an important and under developed skill for leaders. Being curious can have negative connotations but the proverb was never intended to be “curiosity killed the cat”. It was “care killed the cat” and it got changed in the 18th century to curiosity. Curiosity is having a strong desire to learn or to know something. Learning something new grows your brain. Called brain neuroplasticity scientists are discovering that adult brains can still grow and can be trained to improve. The flip side if you don’t keep growing your brain is it will diminish. When you are learning a new skill and you repeat it you grow your brain by making new neural connections. As a leader wouldn’t it be great if your brain was bigger? Curiosity will encourage your brain to change and grow, enhancing and developing your focus. You will spot opportunity, new people, new contacts, and new ways to do things. This is not magic as it will require work and practise just like developing your other skills required time and effort. 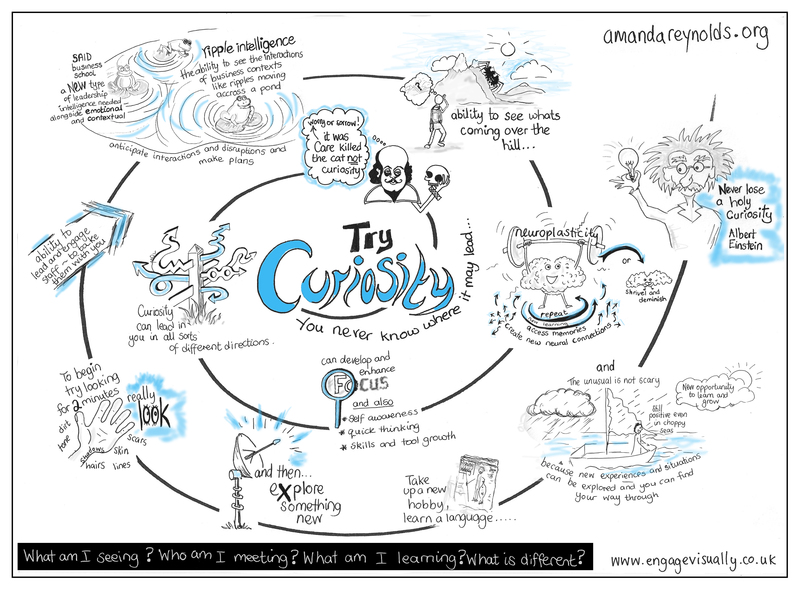 Practising curiosity is a tool that could help you develop your ripple intelligence. Think about it in action in business breakthroughs. Richard Branson went on a delayed and disrupted flight and became curious about how to fix it. He didn’t run airlines, he had no experience in that field but he became curious and now we have Virgin Airlines. Take something apart, look inside see what’s there and how it all fits together and then try and put it back together. Buy a magazine on a subject you do not know about and take time to read it. Take an elder out to lunch (a neighbour maybe) ask about their life story. Ask someone different to you what the latest movie was they saw and then go see it. Learn a language or try painting. After each activity make a note what am I learning? What is different here? Share these reflections with your leadership coach as they can help you process, reflect and grow that brain function a bit more. So go on, have a little try at being curious and remember what Albert Einstein said; never lose a holy curiosity. This entry was posted in Uncategorized on September 4, 2015 by areyns.